It’s time for new tires! Now, where to begin when it comes to determining what size tires you need? 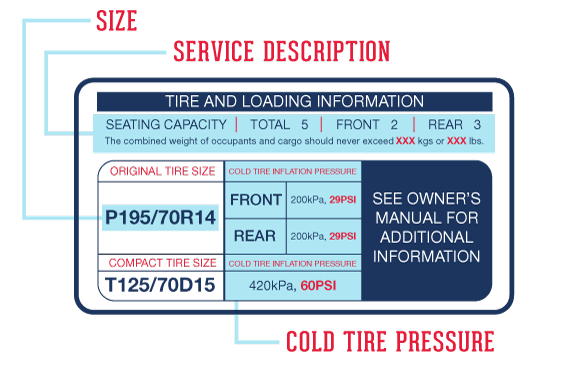 On the inside of your driver door, you’ll find a “Tire and Loading Information” placard with everything you need to know when buying your new tires. You can find your tire's size in your owner's manual or on the tire and loading information placard in your driver's front door jam. If the placard is not there, it can be found on the rear edge of your driver's door. The information is also located on your tires, but it is always best to refer to the original equipment manufacturer's instructions. The tire size is made up of three different numbers. The first number represents the tire width in millimeters. The second is the aspect ratio, which is the sidewall height listed as a percentage of the width followed by an “R”. The last number set is the rim size —rim diameter—, which is listed in inches. When determining what tire you need, all three of these numbers —width, aspect ratio and rim size— should match exactly. The tire service description is actually made up of two parts. The first part is a two- or three-digit number indicating the load index of the tire—this number determines the weight your tire can carry. When replacing your tires, you should select a tire with the same or higher load index than what is listed on the tire information placard. The second part that follows the load index number is a letter called the speed rating—this letter determines the top speed your tire can handle. KPA and PSI are units of measurement used for tire pressure. In this example, all four tires tire should have a PSI reading of 36 to ensure that each tire is operating at optimal standards. Side note, when filling your tires, make sure you take the PSI reading after your vehicle has remained idle for at least 30 minutes. This will give you a more accurate PSI reading since tires inflate when hot. If you feel that your tire pressure is running low or your TPMS light came on, stop by your local Pep Boys for a free tire pressure check.